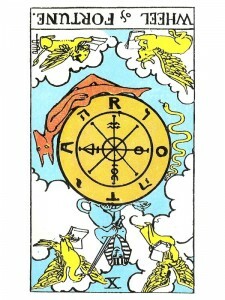 The Wheel of Fortune (R) tells us to always trust and believe in who you are – even when everything appears to be wrong, no matter how hard you try. Have courage now – be strong and put your thoughts on higher things. When you can’t see the way to go – trust in God to turn your situation around. Re-evaluate your abilities. Analyze everything and ask yourself – “Will I benefit by this experience?” Keep planting seeds – you never know which ones will blossom and they all may blossom in time. Your job is to simply keep planting seeds and trusting that there will be results. The clearer and stronger your desire, the more action you will receive as you begin to see the whole picture – retaining the parts you want and eliminating what you don’t want. Your greatest wealth is knowing that you are “complete” within yourself. Your major goal is to discover as much as you can about your “Self” – then work on improving the “quality” of your own life. The more you know about yourself, the better you can deal with any life situation – for the “psyche” is the same in everyone. Involve yourself in an active way and things will happen. Anger is a necessary aspect of your “being” – you are required to meet it head on, look it over and come to terms with it. The only way you can make changes in yourself is to be so angry with yourself that you can finally say “This has got to stop!” The anger will continue until you finally come to grips with it and do what is necessary to balance it. Never struggle against the events that occur in your life – because life will always win out against the personality who is trying to oppose it. If you are a person who always reacts “passively” to whatever life does to you – then this signifies a more important change than just simply a new set of circumstances – it will open the door to a new awareness of the responsibility you have for your own life. You may be ill prepared for the chance you are considering or you may be invoking divine providence to intervene inappropriately. Expecting something for nothing as in gambling. Possibly an improper “I deserve this” attitude. The problems that come from depending solely on “luck or fate”. A “mind-over-matter” school of thought. Do you find it hard to accept periods of boredom or routine? In the first position: You will work to help others find their personal understanding of faith. In the second position: There may indeed be observance and ritual, but with some imbalance of this archetype here, such as mistaking presumption for faith or assuming faith is a lack of doubt. In severe extremes – on one hand everything is left up to the external God; on the other hand there is rampant self-will presuming that God approves of everything it does, in effect assuming the entire role of God. In the third position: Even though this is your vote and your free will, it is suggested that you use this opportunity for invocation for the benefit of others. In the fourth position: Distorted, this dedication may be to only half of the Godhead and so prostrate itself before the altar of the external will of God, or the internal will of man. In the fifth position: The timing of this process, the method or some other factor may be less than it could be. There may be a mental act of worship that is inappropriate. Too much talking to God. In the sixth position: Still waiting for someone or something to spin the Wheel for you? In the seventh position: There will be difficulty in getting the message and/or getting the message across, as you have trouble rationalizing the irrational. A hint: Keep the wheel in plain view for awhile and let it talk to you. It is a transformer that brings the higher energy of the Spiritual Plane down into the energy of language in the Mental Plane just below it. In the eighth position: At one extreme, there is a lot of action and bravado as if to defy the odds. At the other extreme, is an inability to spin the Wheel for fear of where it may stop. In the ninth position: Too much listening. For now, all that is to be said has been said. Your turn. In the tenth position: The messages here may very likely be for you to pass quickly on to someone else, if you can just find the words.